HONG KONG—The wheels have fallen off what was to have been the first substantive discussion between student leaders and the Hong Kong government. Scheduled for Friday, the talks were meant to resolve the current crisis and ultimately result in getting the thousands of pro-democracy young people and their supporters off the streets. Tens of thousands of students have blocked key roads here in an effort to force the government of Hong Kong, a special administrative region of China, to engage in a dialogue about their wish to elect a chief executive of their own choosing. Current practices mean that Hong Kong’s leader is heavily vetted by Beijing. Carrie Lam, Hong Kong’s chief secretary—the head of the civil service—made clear on Thursday that the talks were off. “I truly regret that we will not be able to have a meeting tomorrow which will produce any constructive outcome,” she said. She then blamed the students. Several hours previously, the students had held a press conference announcing that they had united forces with the original Occupy Central group, founded by the law professor Benny Tai, which first proposed the notion of mass civil disobedience in the financial center of Hong Kong. Tai’s scheme was superseded by high school and university students striking their classes and then sitting in. They are now the main force in the occupation of Admiralty, the government district in Hong Kong. A sprawling, yet tidy and peaceful, encampment blocks a 10-lane roadway. 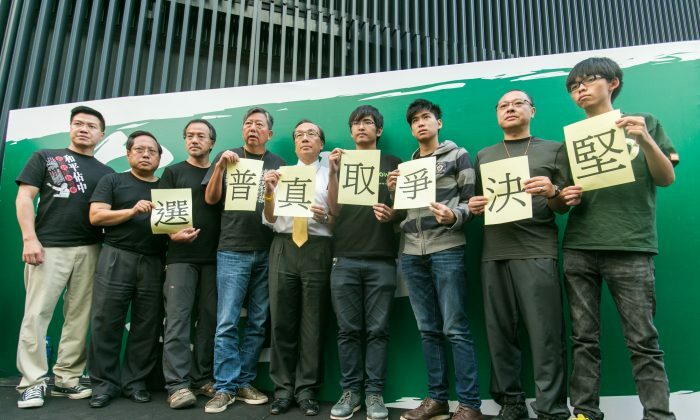 Part of the newly formed coalition the students announced includes pro-democracy lawmakers. Alan Leong, leader of the Civic Party, for example, said he and his colleagues intend to begin blocking spending requests from the government in the Finance Committee, except for basic livelihood and emergency items. It was the coalition’s raising the stakes of the protest, part of an attempt to maintain pressure on the government, that Carrie Lam said led her to conclude that talks would be fruitless. Soon after Lam expressed her “disappointment” with the students, they held another rally on the roadway and called for a renewed mass turnout on Friday. “Whether it’s under the bridges or in front of the chief executive’s office, or in Tamar Park, they’re all suitable places for camping and setting up a long-term camp and putting pressure on the government,” said Alex Chow, the general secretary of the Hong Kong Federation of Students, currently the main face of the activist force. The likelihood that anything substantive was going to come of the discussions was low to begin with—but an attempt at discussion with Hong Kong’s leaders is the students’ only channel for attempting to influence the authorities in Beijing who are behind their city government. At the moment Hong Kong’s chief executive—effectively its mayor—is chosen by a committee that is composed of elites whose loyalties skew to Beijing. In 2007 Beijing said universal suffrage “may” be used to elect the chief executive in 2017, a statement that Hong Kong’s democracy activists have demanded be fulfilled. In response, Beijing said at the end of August that all the city’s voters would elect the next chief executive. A new election committee Beijing would effectively control would present voters a small number of pre-selected candidates. This idea is rejected as “fake democracy” by Hong Kong’s politically-conscious youth, who are frustrated with government policies that increasingly seem to favor the interests of the mainland rather than those of Hong Kong’s own people. This is reflected most viscerally for some in real estate prices, but also in Beijing’s heavy influence over the media, its attempts to encroach on Hong Kong’s education system and famously independent civil service—a legacy of Hong Kong’s past as a British colony—and the outsize role of Beijing-friendly tycoons in the city’s economy, while university graduates and the young struggle just to make ends meet. In some ways the students’ concerns are to do with the optics and attitude of the Hong Kong government. They are demanding that Leung Chun-ying, the chief executive, accurately represent their interests to Beijing, and encourage Party Central to allow a more lenient interpretation of the Basic Law, Hong Kong’s mini-constitution, leading to a process that will produce a more representative leader. “At least if they came out, we would feel that they’re willing to talk. But now they refuse, it just makes the situation worse,” said Harmony Li, a 26-year-old administrator. “The government has the responsibility to propose resolutions for responding to the aspirations for true democracy and universal suffrage,” said Alex Chow, the student leader. They feel the government is instead merely representing Beijing’s interests to them, and feeding incomplete and false advice back up the line, resulting in a harder line from central authorities. “Sincere” dialogue on behalf of the government, students say, would alleviate some of their frustration. Hong Kong authorities are attempting to prevent the students from using the threat of occupation to increase their bargaining power.